An early cover stating the authorship as Lord Byron, when really it was Dr. John Polidori. Since it’s October and the weather here has finally started to behave in a seasonal fashion (Rain! Getting dark early! Cooler temps! ), I thought it might be a good time to look out for a slightly creepy read. Since I’m not a huge fan of horror and gore, I tend to move towards the “cozy creepy” and serendipitously I came across a mention of this early version of blood-sucking vampires. Ooooh. Count me in! 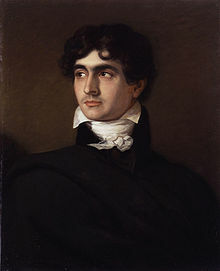 This title, The Vampyre [link to Project Gutenberg], is a fairly short (in length) short story that first appeared in print in 1819, but was actually written in 1816 by Dr. John William Polidori, a traveling doctor connected with that group of Romantic writers including Lord Byron and his small creative gang which also included Percy Shelley and Mary Shelley (although they weren’t married at the time). The friends (plus their doc Polidori) had been traveling around Germany and one stormy night, the group decided to see who could write the scariest horror story. Out of this challenge arose the classic, Frankenstein: or the Modern Prometheus (as its title is punctuated) from Mary Shelley and this short story, The Vampyre. That was sorted out not soon after, and the familiar trope of the vampire as a high-class fiend with a thirst for the blood of high society maidens was born. Warning: An extremely high number of spoilers abound in the text below. Back to the story: the plot is very similar to the typical vampire trope (although still new to readers at the time), and follows Aubrey, a young English gentleman, who meets mysterious Lord Ruthven at some parties in London. No one seems to know Lord Ruthven very well (although rumors abound), and Aubrey ends up following him to Rome. After Lord Ruthven seduces a daughter of a mutual acquaintance, Aubrey leaves and travels on to Greece where he meets (and is attracted to) Ianthe, an innkeeper’s daughter (beautiful but not really suitable for the lover of a high-society young man such as Aubrey). Aubrey rejoins Lord Ruthven (why??) but Ruthven is then attacked and murdered by some bandits. Before Ruthven pops his clogs, he makes Aubrey promise not to tell anyone anything about Ruthven’s life (and death) for a year and a day. Aubrey promises (of course he does). Aubrey goes back to London and is surprised when Ruthven shows up alive and well. Reminded of his promise to Ruthven, Aubrey stays quiet even when Ruthven is working on seducing Aubrey’s sister. Helpless to rescue his sister, Aubrey suffers a nervous breakdown. The happy couple get engaged – on the very day that Aubrey’s promise to Ruthven about staying silent ends. Oh. My. Gosh. Aubrey goes ahead and pops his clogs, but not before writing a letter to his sister warning her about Ruthven’s evil ways. The sister doesn’t receive the letter in time. That rascal Ruthven marries her, and on her wedding night, she is discovered, bloodless and limp. Ruthven disappears, never to be seen of again. So – I really enjoyed this read (and the resulting info I found about it.) This was an unexpectedly interesting trip down some Wiki rabbit holes…! Note: I had thought this story would be under the Victorian umbrella, but apparently not. Her father, King George III, died in 1820, but Victoria didn’t inherit the throne until she was 18 (1837) and until her father’s three brothers had all died with no issue.